The Codex Vaticanus, so called because it is the most famous manuscript in the possession of the Vatican library, is generally believed to be from the fourth century, and is thought to be the oldest (nearly) complete copy of the Greek Bible in existence. Lacking from it are most of the book of Genesis, Hebrews 9:14 to the end, the Pastoral Epistles, and the book of Revelation; these parts were lost by damage to the front and back of the volume, which is common in ancient manuscripts. The writing is in capital letters (called uncial script) without spaces between words (scriptio continuo), and is arranged in three columns on the page. 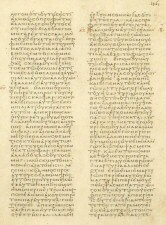 Like other early manuscripts, its text is somewhat shorter than the later manuscripts, less harmonistic in parallel passages of the Synoptic Gospels, and it often agrees with the texts presumed to underlie the ancient Coptic, Syriac, and Latin versions against the later Greek manuscripts. 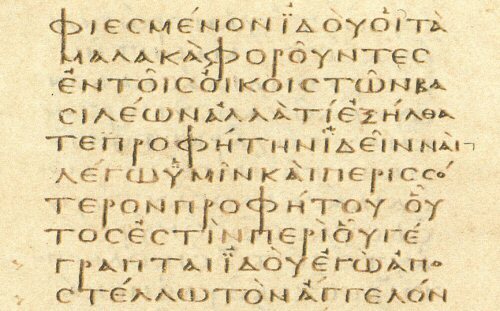 It is relatively free of obvious transcriptional errors, and is usually taken as the best representative of the ancient "Alexandrian" form of the New Testament text. For many years Codex Vaticanus was highly esteemed by scholars who knew next to nothing about it, besides its evident antiquity. Johann Bengel in his Gnomon (see Bengel 1742) makes the following remark concerning it: "The number of witnesses who support each reading of every passage ought to be carefully examined: and to that end, in so doing, we should separate those codices ... which are known to have been carefully collated, as, for instance, the Alexandrine, from those which are not known to have been carefully collated, or which are known to have been carelessly collated, as for instance the Vatican MS., which otherwise would be almost without an equal." (Fausset's translation, vol. 1, pp. 15-16). It was jealously guarded by the librarians of the Vatican, and practically inaccessible to competent scholars for most of the nineteenth century (see remarks under Mai 1857), during which its reputation was magnified by the mystique surrounding it. When at last its text was fully revealed, in many places seconded by the recently discovered Codex Sinaiticus, the stage was set for the influential text of Tischendorf 1869 and the even more important edition of Westcott and Hort 1881. Tischendorf 1867 was the first reliable edition of the manuscript to be published. It was preceded by that of Cardinal Mai (see Mai 1857, partly corrected in Vercellone 1859), and by Hansell 1864. Mai's edition was soon discovered to be very faulty, and scholars generally did not accept it as being more reliable than the collations which were already available to them (see Birch 1788, 1798, and Ford 1799), and Hansell's edition was based upon Mai's. Later editions of the manuscript are Vercellone 1868, Cozza 1889, Vatican 1904, and Martini 1968. An excellent color facsimile of the entire codex has been published: Bibliorum Sacrorum Graecorum Codex Vaticanus B. (Roma: Istituto Poligrafico e Zecca dello Stato, 1999). Full collations are in the apparatus of Tischendorf 1869 and Tregelles 1857 (for which see the Corrigenda). An English translation is presented in Parker 1863. The most complete collation in English is in Tischendorf 1869 b.